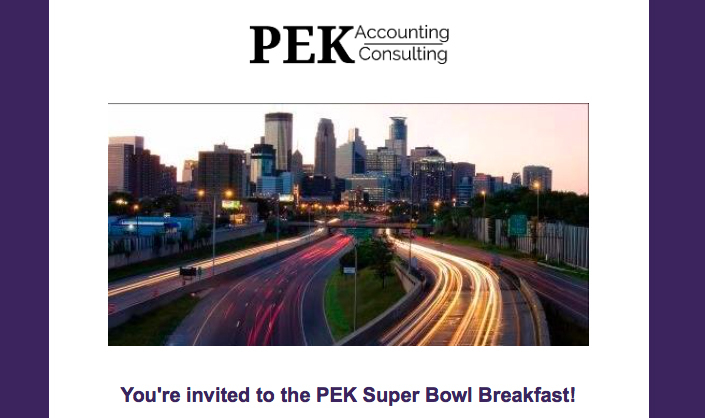 You’re invited to the PEK Super Bowl Breakfast! Join us to celebrate Super Bowl 52 at US Bank Stadium! o Are you ready for the Super Bowl? Terri Mattson – Corporate Wellness Expert, Beginning Today Lifestyle Wellness, LLC. Terri will share how to have a fun and healthy Super Bowl Party! Jon Halleen and Mark Spiers – Co-founders of GAPWORX LLC. Jon and Mark will present their Sales Playbook approach to helping companies improve their sales performance. We look forward to seeing you and celebrating the Minnesota Super Bowl!